Before I had the boys my sister (in law) had introduced me to the world of cloth nappies when my nephew arrived. I wasn’t thinking about babies or nappies at this point but it made perfect sense. The initial outlay seemed a lot at the time but you can literally save a fortune using cloth nappies and that really appealed, plus they were super cute! When I fell pregnant I quickly began researching cloth nappies. I knew we’d have to put money aside to be able to afford the initial outlay so I wanted to be thorough and make sure we chose well. I loved the fun prints my sister had got but Mark was a bit bewildered by the prefolds and wasn’t particularly keen on the idea reusing wraps for multiple changes. After delving into cloth nappies online, even back then there were lots of options available. I found a company called Babipur and they stocked all the brands I was looking at and they were so helpful (I may have phoned a few times to ask lots of questions!) Mark and I decided to go with an All in One nappy (AIO) so there wouldn’t be any folding to worry about. I couldn’t decide between Tots Bots or the Close Parent Pop In; so I got 10 of each. and ALL 10 Close Parent Pop-ins! When Edward finally arrived in 2010 (albeit nearly 2 weeks late and via the rooftop exit) he weighed 10lb 9oz so he conveniently skipped the newborn nappy phase and I was able to jump straight in. We had our fair share of problems, fitting; specifically leg leaks, being the most common. I ended up using a Tots Bot wrap over the top of the nappies for a spell but we persevered through the awkward stages while we sussed it all out. About 3 months in we had it nailed. 2 extra loads of washing a week was barely noticeable, stuffing the nappies back into shape was oddly therapeutic and they were so pretty to look at hanging up round the house. They were easy to put on and between us we mastered fitting them really quickly. We both actually think they’re easier to fit than disposables. We were saving money and that was being spent on arguably much more useful things than something designed to be used once and thrown away. Our waste was significantly less than every other house on the street and I remember our bin men at the time asking what I was doing with all the dirty nappies! I sadly encountered quite a bit of negativity using cloth nappies. My friends thought it was disgusting, my family were claiming to be supportive but actually taking bets when I’d give up and use disposables. Even the Health Visitor I saw was against it but I just quietly plodded on enjoying Edward’s enormous fluffy bum at every opportunity. We moved to Scotland in 2011, away from all our friends and family when Edward was about 8 months old. It was a fresh start and I threw myself into all the Mum and Baby groups and was the mad hippy one with my “dirty” nappies and sling in the corner getting shunned by the single use consumers. It was a shame that so many thought disposables were better, easier and cheaper. Frankly, reusable nappies ARE better! They’re also a whole lot prettier! We had Oren in 2012 and this time round there was no outlay for nappies we just used the same ones. It was brilliant! The rise settings had to be adjusted for each boy but other than that it was so easy. Daily washing became a thing until the newborn phase passed but we quickly got into a routine. I had a year without nappies (gasp) between Oren toilet training and Loki arriving in January 2016. The same nappies I bought back in 2010 were washed and sitting ready. They had been thoroughly abused for nearly 5 years of use at this point but most of them still going strong. I’d lost a few Tots Bots nappies so April’s Real Nappy Week 2016 came at a great time and I topped up my stash with Tickle Tots, Milovia, more Pop Ins, bomb proof Tots Bots Wraps and Bamboozles and one of my new favourites Baba & Boo. 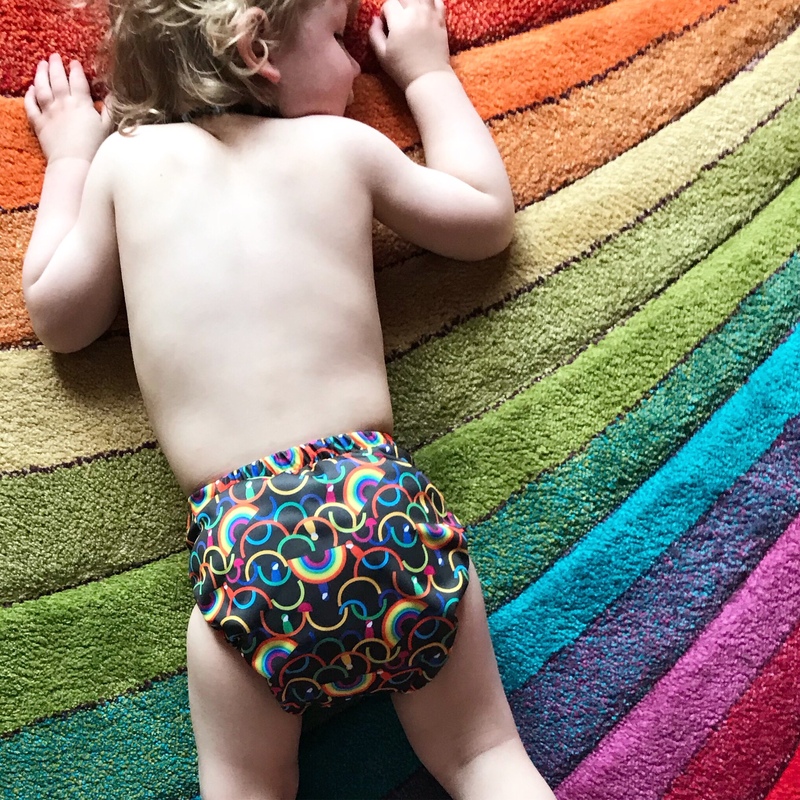 *I’ve just done a guest blog over on Babipur for RNW on Baba & Boo nappies, you can find it here. Loki is 2 now and becoming more aware of literally everything. I think this year might be my last using cloth nappies so I’m going to shamelessly enjoy every cute bum I can before I call time on Team Cloth Nappy for good! 8 years using cloth nappies is good run though. I’ll always be a real nappy advocate and help spread the fluffy bum love! I love that we both used our same first lot of nappies for three kids each! I also think it’s great (and important!) that our kids see us using them with ease and by choice. Paving the way for the next generation! Be the change! 💪🏻🌍 my boys don’t know any different – cloth is normal for us and we’ll do all we can to spread the fluffy bum love!